As I get more and more into the blogging community, I often come across blogs that have a special challenge or feature, and I have thought to myself that I would like to do something like that. But to blog EVERY day for an ENTIRE year, or even once a week with a special theme ... I'm not that together. I have a hard enough time coming up with random stuff to blog about, let alone have some sort of regularity. Well, all of that is over ... for at least the month of April! 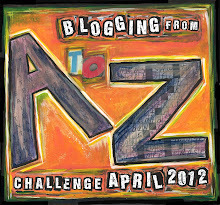 I have decided to participate in the "Blogging from A to Z April Challenge!" I will be posting blogs for 26 days in April (April 1 and then every day but Sundays). Each post can be about anything, but it must have a theme representing the letter of the day. This will be a great way for me to get my feet wet, see if I'm dedicated enough, and possibly expand to something bigger! You never know what may come! So, mark April 1 on your calendars to come and see my first challenge post!